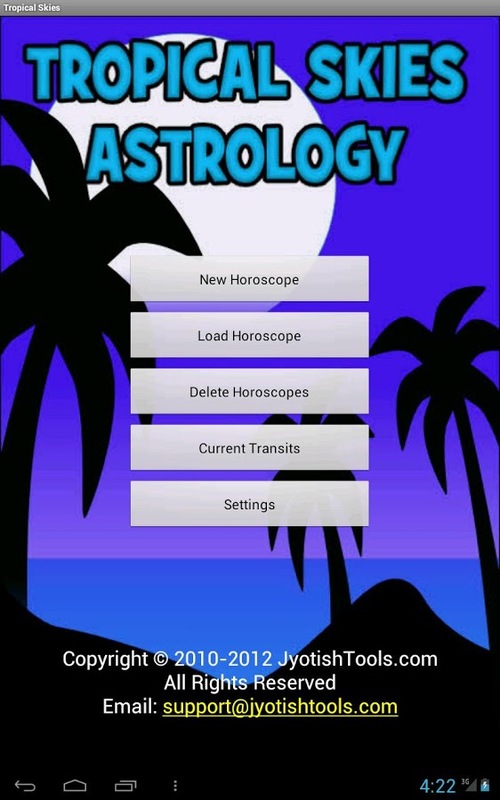 Astrology apps for the Android serve two kinds of users. On one hand, there are people who enjoy reading prepared horoscopes and forecasts. On the other hand, there are students of the art who can interpret charts on their own, but need a program that will do the calculations for them. The apps listed here are a mix of horoscopes, chart calculators and astronomical tools. No matter what type of stargazer you are, you should find something here you can use. As of mid-2014, all of these apps were available at the Amazon app store for the Android. However, that is not a guarantee that it will work on your device. Before you download any of these apps from an app store, please check each product description for any bugs or incompatibility issues. Oh, and make sure Mercury isn’t retrograde. Astrology assigns more than just one “sign” to each person. Aside from the commonly known sun sign, each of us also has a sign for each of the heavenly bodies at our birth. The app Your Self interprets the zodiac sign positions of the sun, moon, ascendant (rising sign), Mercury and Venus in your birth chart. You can also read about your Chinese zodiac sign, personal numbers (based on your name) and various horoscopes. What you get amounts to a mini astrological and numerological reading that can be astonishingly accurate (if you agree with the reviews on Amazon). For best results, you will need to enter your full birth details. The developer of this app uses text derived from various websites such as astrolabe.com, but users probably won’t care about that… or the rainbow-colored background, for that matter. This app is one of the nicest looking and most feature-rich of all horoscope apps around. By simply entering your birth data, you get zodiac sign interpretations, daily forecasts, yearly forecasts, zodiac compatibility readings and numerology personal numbers. You also get to know about your Chinese zodiac sign, tree and color (though it isn’t clear how they arrive at some of this information). 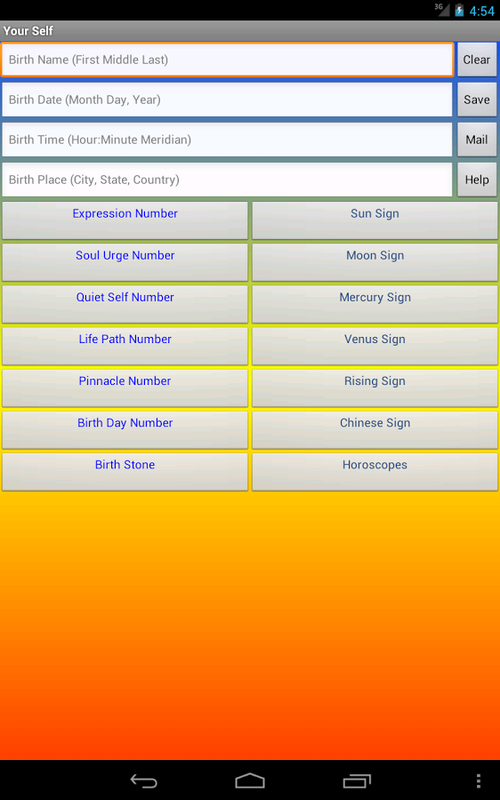 Astrology Premium has a clean user interface, easy-to-read text and attractive graphics. You will need credits to access Astrology Premium features, but unlike many so-called “free” apps that require you to upgrade to a paid version to enjoy full benefits, this app offers you several ways to earn credits. When you install the app, you get free credits to use right away. You also get credits when you install or check out other apps by the same developer, “like” their Facebook page, and/or wait a couple of days before you use the program again. (Every 3 days you don’t use the program, you’ll get 1 free credit up to 20 credits.) If that’s too much of a hassle for you, you can either buy 100 credits at a time or purchase the full version. In the full version, credits are disabled and you get permanent full access to all features. If you can read astrology charts and just need an app to calculate them for you, check out Aquarius2Go Astrology. It performs natal, transit, synastry, solar arc and secondary progression calculations. You can view an aspect table, hide or show details in the chart wheel, or choose from four popular house systems: Placidus, Regiomontanus, Koch and Equal. You can also change the glyph for Pluto. On the downside, Aquarius2Go lacks a built-in atlas, so you need to manually enter the geographical coordinates and time zone of each new location you use. Also, there is no option to disable minor bodies such as Lilith and Chiron, and it does not display the Part of Fortune. Charts display in portrait mode only. 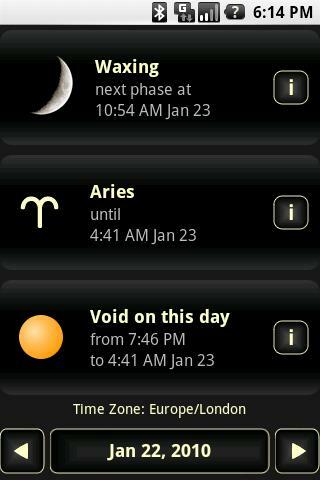 Like the app Aquarius2Go Astrology, Tropical Skies generates charts on the go, but it is easier to use and has a smoother-looking interface. It appears to be bundled with a U.S. atlas that includes major cities. You can choose among six house systems: Placidus, Koch, Porphyry, Equal, Regiomontanus and Campanus. Tools include a personal atlas, notes and the ability to save a chart as a picture. You can edit, save and load charts. Advanced users can switch between the sidereal and tropical zodiacs, show or hide aspects (including minor aspects) and disable the minor body Chiron. 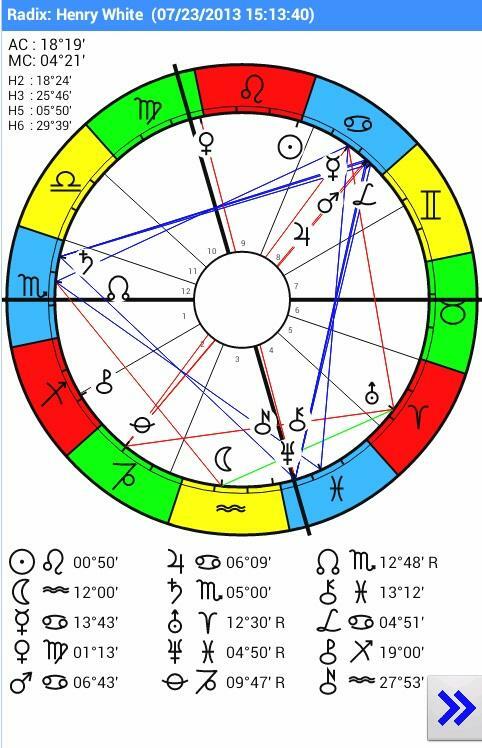 Data includes planetary positions, house cusps, an aspect table, and a table of triplicities and quadruplicities. Chart view works in both landscape and portrait modes. Tropical Skies Astrology isn’t available for free download, but as of this writing, you can take it for a test drive via the Amazon app store. As the planets orbit the sun, they change positions in relation to a person’s birth chart and make various contacts with it. These contacts are known as “transits,” and astrologers regard them as a more authentic type of horoscope since transits are tailored to each individual birth chart. 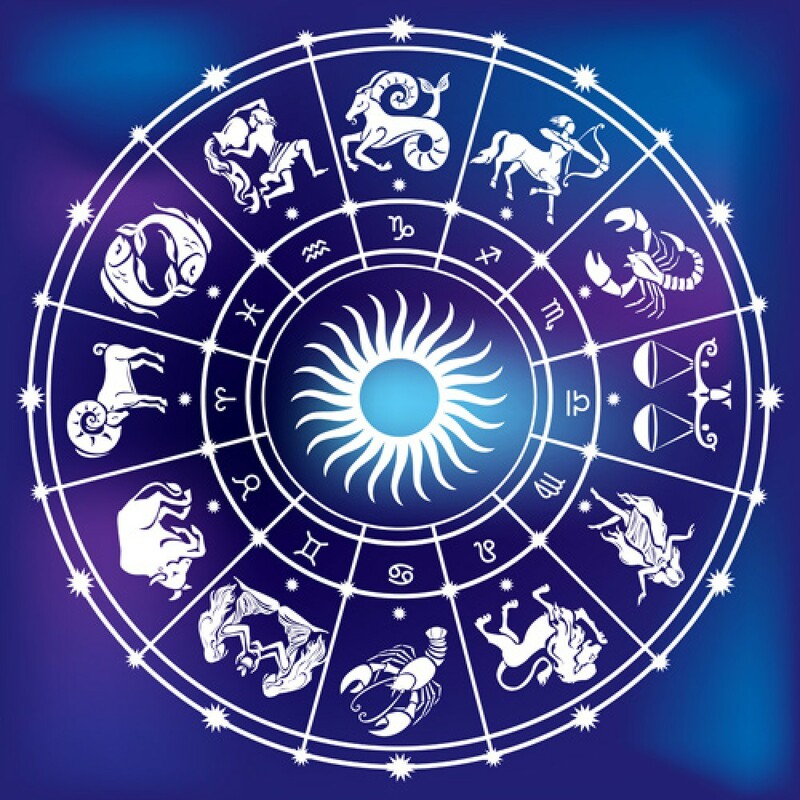 This app will help you explore this fascinating area of astrology. To use Transits, you enter your birth date, birth time and time zone; then you choose a date to look up. Birth place isn’t considered, and the developer explains (in a comment on its Amazon app store product page) that it is unnecessary for this app. Transits will generate a report that includes astrological positions, a chart wheel and a brief reading for each transit. While your chart might not be totally accurate due to the lack of birth place information, the readings are well-written. It is ideal for checking your personalized forecasts on the go. You can find several moon phase apps for the Android, but iLuna is unique in that it delivers just the kind of information that an astrologer needs. After you choose your local time zone, this app will show you the current lunar phase, the zodiac sign the moon is in and whether it is “void of course” (making no aspects to other planets until it changes signs) or not. 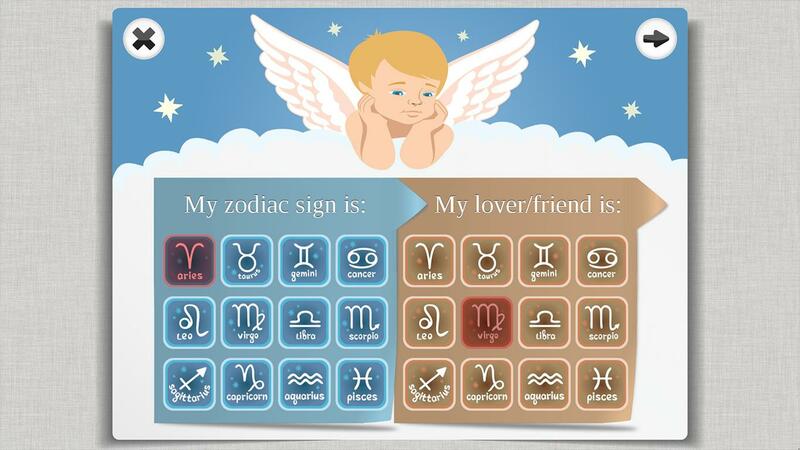 Need help understanding these astrological influences? Click any item for a pop-up explanation. You can view the lunar positions for past and future dates, or change your time zone. iLuna shows accurate information from the year 2000 up to 2030. 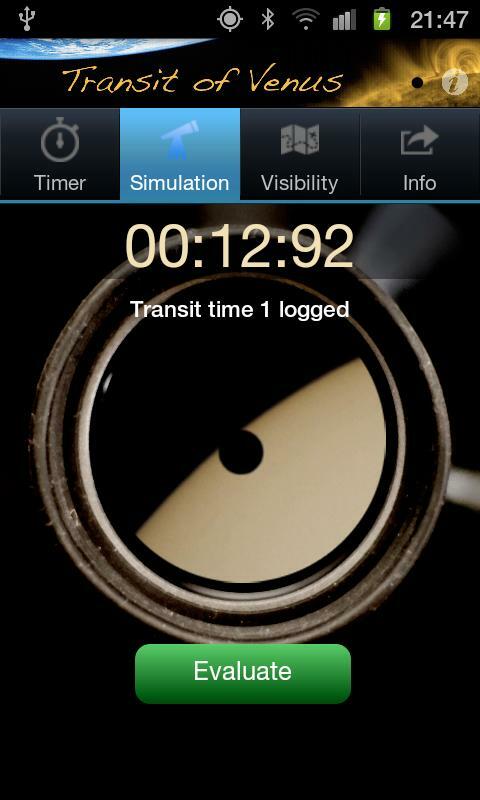 If you are an avid astrologer and moon watcher, iLuna makes a great tool on your Android device. The zodiacal position of the planet Venus is supposed to describe how a person shows affection and what is most valuable to them. This simple app helps you find out your Venus sign even without knowing your full birth data. 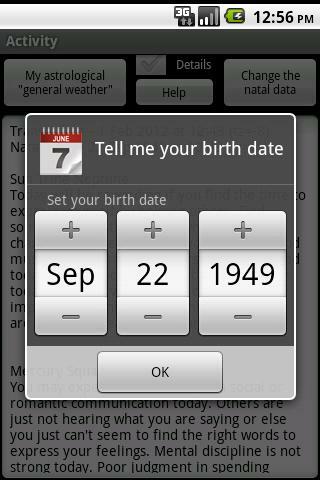 To use this app, first look up your birth date in the Venus signs table. When you have identified the zodiac sign Venus was in when you were born, look up the interpretation for that sign. Each reading is detailed enough to fill up the entire screen. Here is a unique app that is sure to entertain astrology lovers and hobbyists.